This article is a continuation of previous research undertaken in Berlin during June 2013, and serves to clarify the hypotheses and findings of both spatial research exercises. The research in Germany aimed to understand safety perceptions of both the tandem members as well as the different user groups of Görlitzer Park in Berlin. From the beginning the tandem agreed that it would be necessary to repeat the exercise in South Africa to develop it into a larger investigation of a comparative study in a public space in Johannesburg (JHB) – in order to gain a broader understanding of different safety perceptions of users in both contexts. 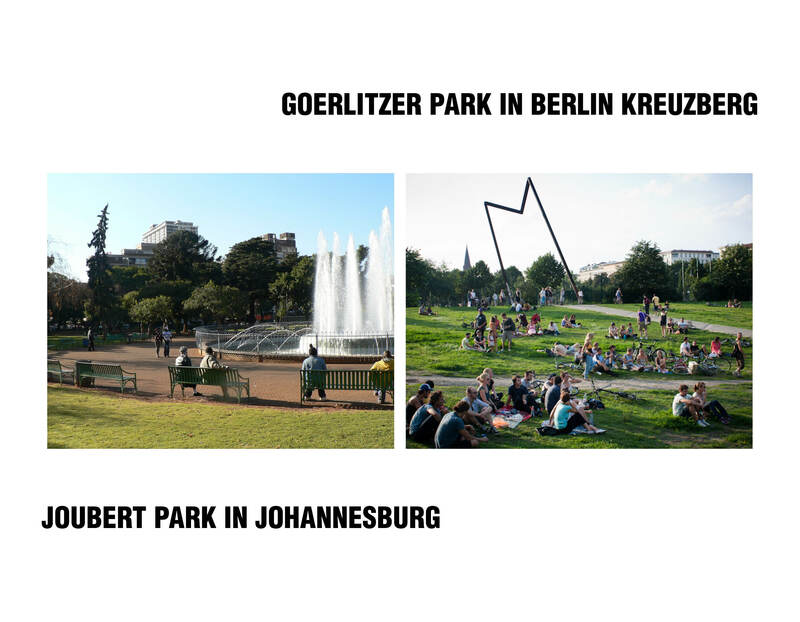 For a final comparison of safety perceptions in Berlin and JHB it was important to find a site which would be similar to Görlitzer Park and which would allow the tandem to use similar methods. 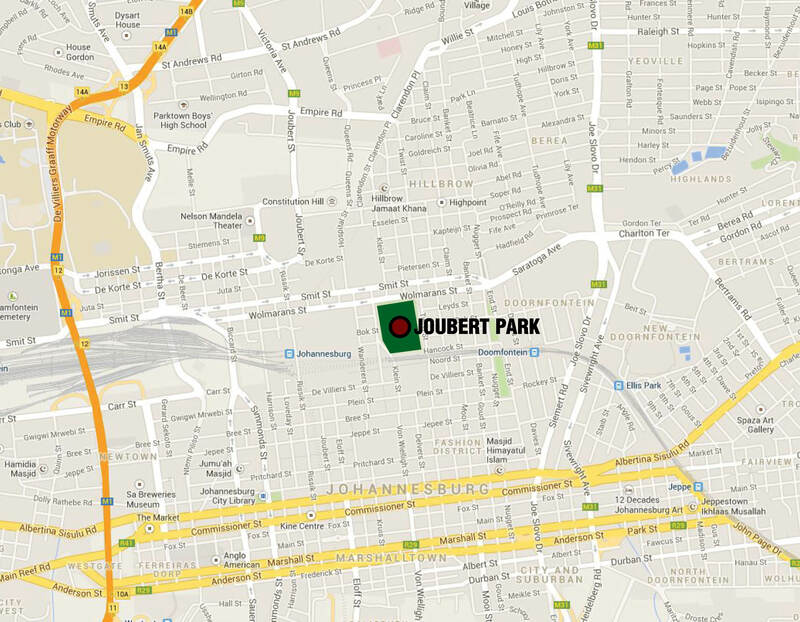 The tandem chose the site of Joubert Park in JHB. 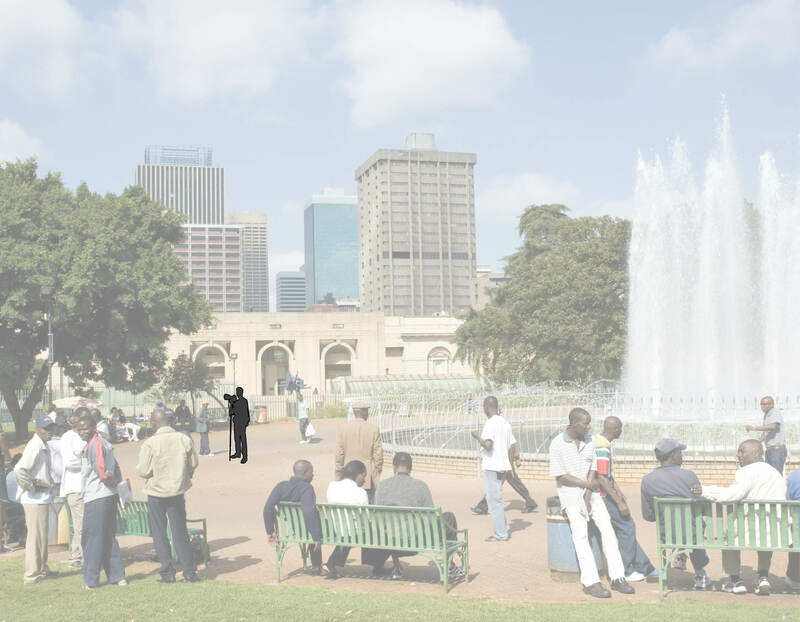 Joubert Park is situated in the Central Business District (CBD), which was established in 1906 and went through a period of neglect between the 1990’s and early 2000’s, now being one of the largest and busiest green spaces in the Johannesburg CBD. 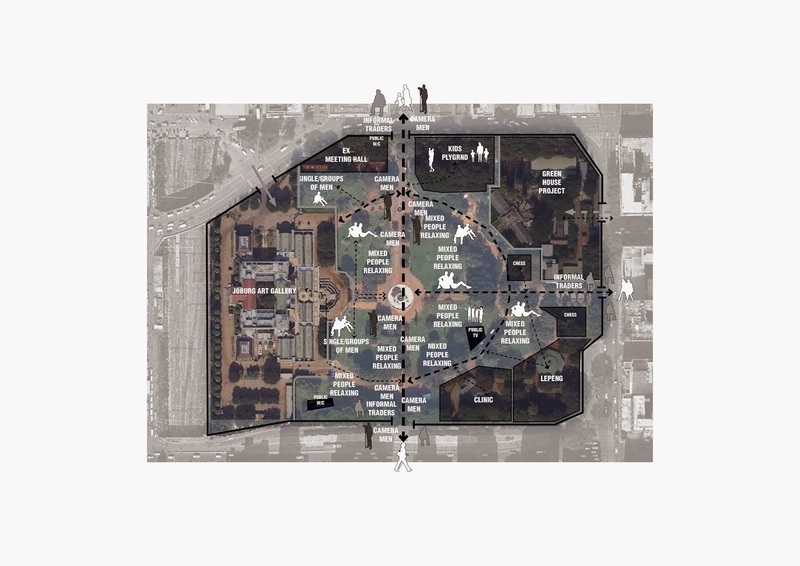 Both sites are contentious green spaces and both are located in central areas of the city and are used by many different user groups which share the park. 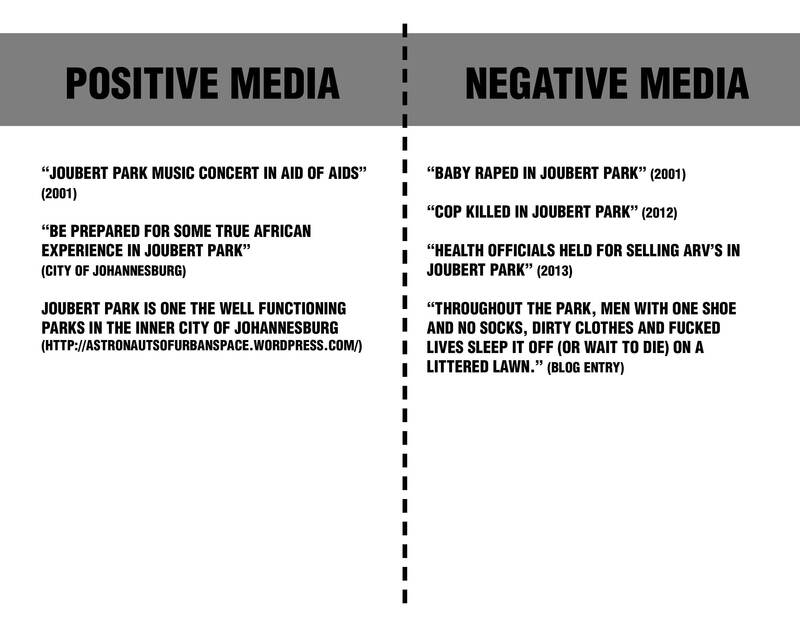 The fact that Görlitzer Park und Joubert Park are both associated with crime/danger but at the same are used as a leisure space for families made the comparison very interesting to the tandem in regard to the perceptions of safety. 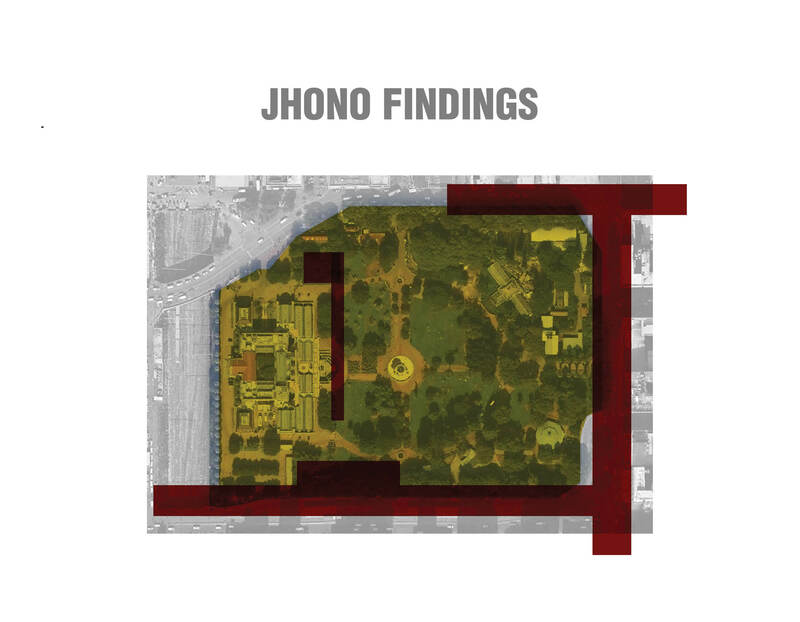 Hanna wanted to discover how public spaces are used in Johannesburg compared to Berlin due to the issues of safety, while Jhono wanted to contrast his findings in Berlin with his understanding of public space on JHB and South Africa. What are the different user groups of the park? What are their perceptions of the park? What are similarities and contrasts of the perceptions? What is our own perception of the park and how did it develop over the week? 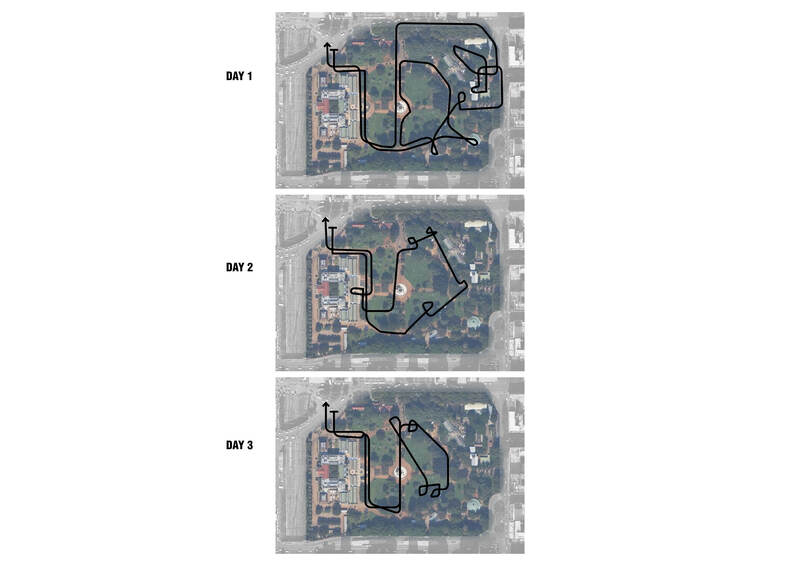 Transect walks / Flaneur(ing): Every day and at different hours the tandem walked through the park taking different routes. The aim being to develop a subjective and experiential idea of the area and see how the user groups change during the day. 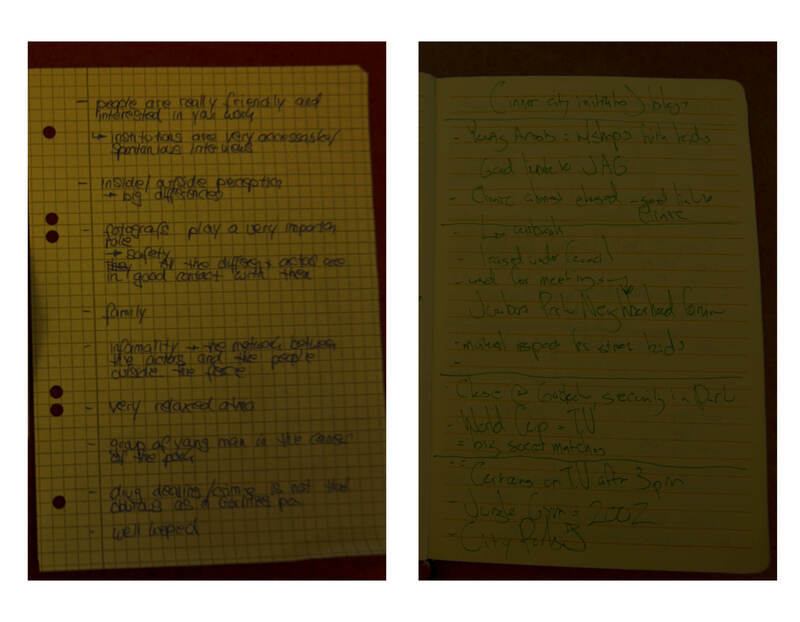 Field diary: Both tandem partners wrote a personal diary after ending the site visits every day. The aim was to find out how the personal perception of the park changed from day to day; the tandem partners were not allowed to talk about the diary entries, in order to make sure that the German and South African perceptions did not influence each other. Media screening: The tandem searched through media (newspapers, blogs, tourist web pages and forums), looking for articles or stories on the park. The aim was to find out how the park was perceived not only by user groups and the tandem, but also Berlin and the rest of Germany. 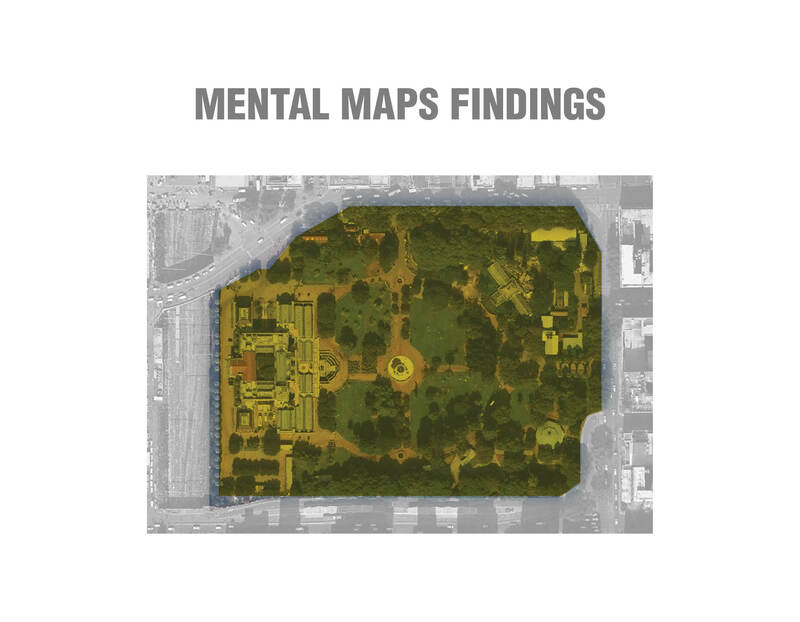 Mental Maps: Users were given a blank map and were asked how they use the park and where they felt safe. 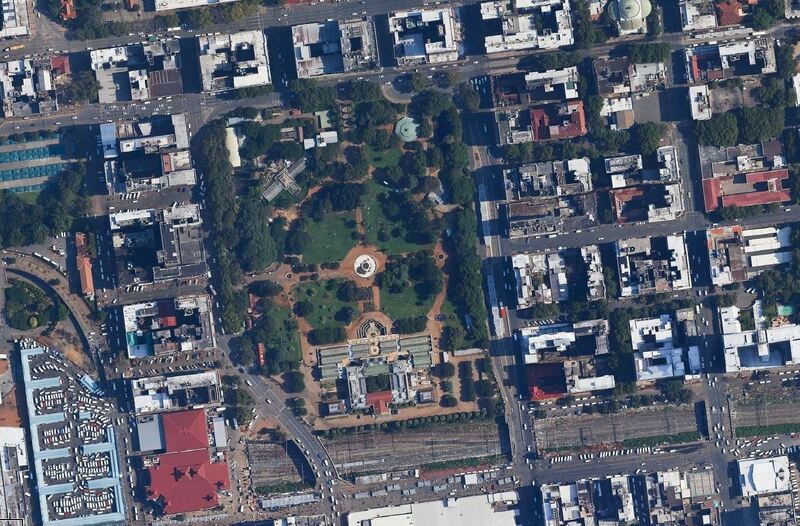 The most evident finding was that the four institutions play a crucial role for the security in the park. 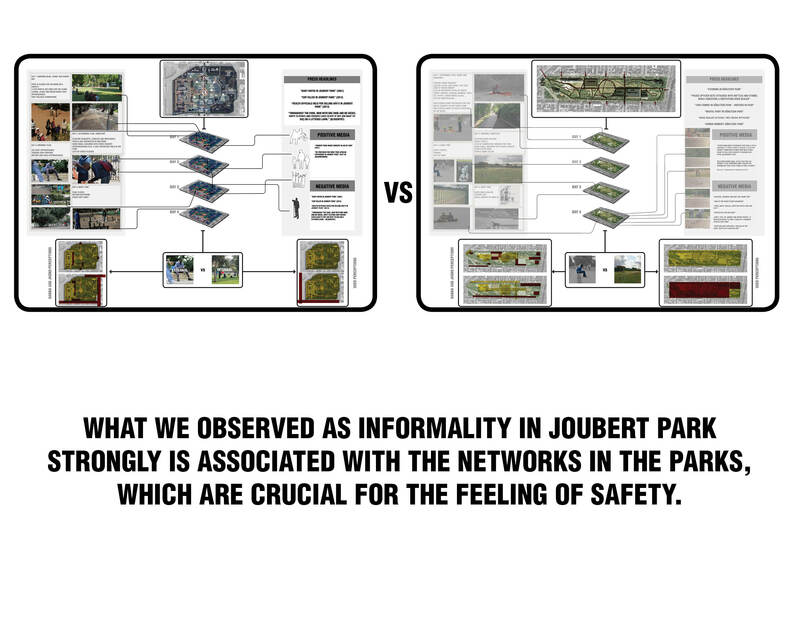 After being part of Joubert Park for many years, the institutions established an loosely defined safety network. 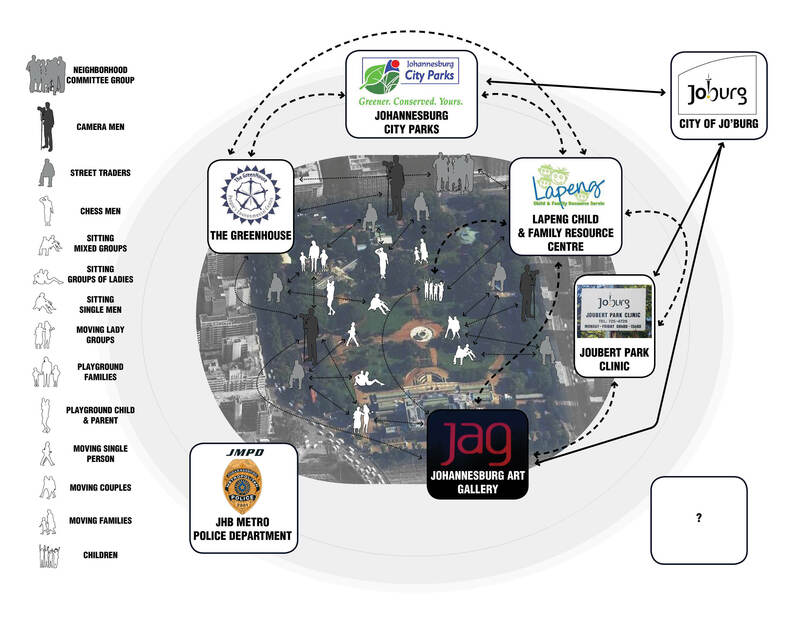 All four organizations are in regular contact and hold meetings to discuss the latest developments in the park. The institutions also work together for example by sending children from the Lapeng Center to work shops in the Art Gallery or in the Garden Center. 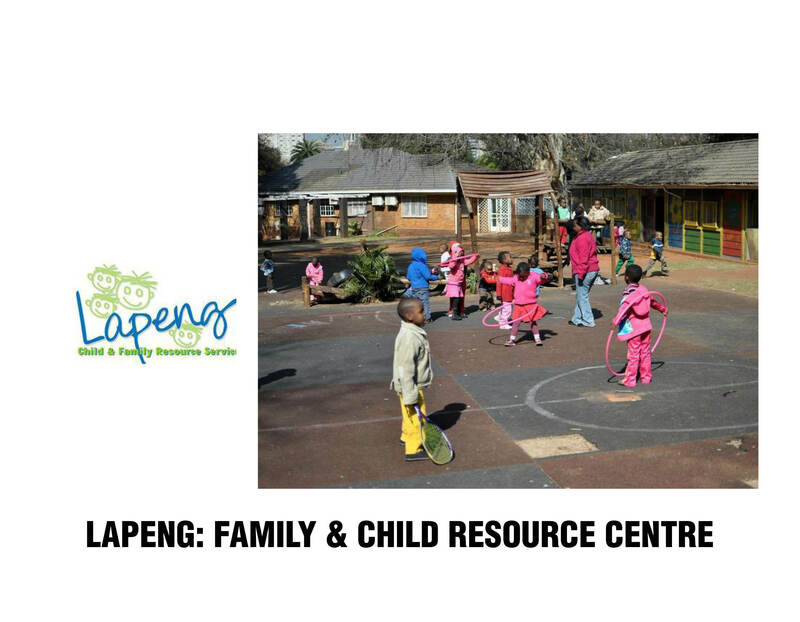 Especially Lapeng Child and Family Resource Center has played a central role in transforming Joubert Park from a dangerous no-go area to a place for community recreation and an inner-city green space. A very interesting “institution” within the informal safety network are the photographers situated mostly at the entrances of the park. The fact that there is many of them and that they are “armed” with cameras makes them very important for the parks security. They watch the people entering and leaving the park and as some of the interviewees informed the tandem, as soon as crime happens they inform the police and the gates are being closed. The second important finding was that there are large differences between the “offcial” perceptions of the park such as the media reports, official documentation by local governance structures on their websites and the informal perceptions, found in the investigation through discussions with the different users groups and personal perception of the tandem. In the beginning both members of the tandem were worried about spending a whole week in Joubert Park; Jhono due to his experiences in public spaces in various cities in South Africa and Hanna due to the many negative and frightening stories she heard about Joubert Park. The daily transect walks, the field diary and the final mental map revealed how quickly the perception of safety of both tandem members changed during the week. 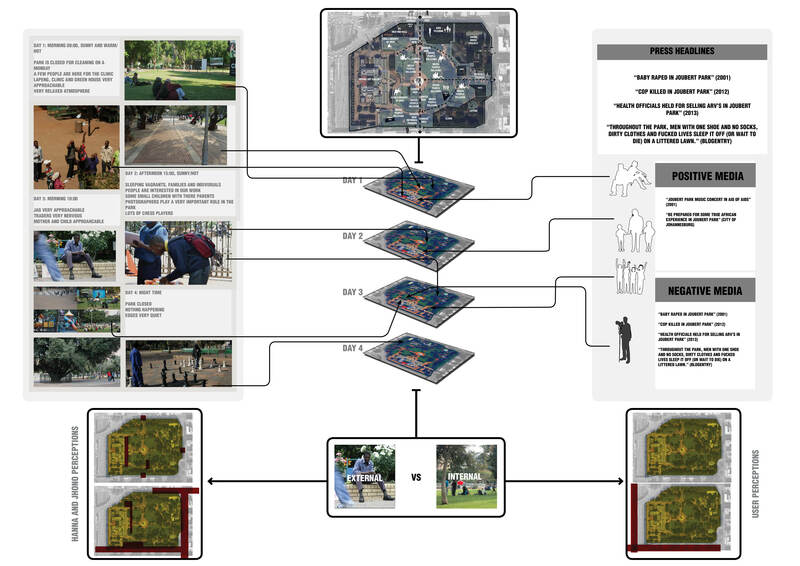 Knowing about the informal safety network in the park, Hanna felt safe and described Joubert Park as a “green island” in the inner city, comparing it to green spaces in Berlin. Jhono was also surprised how relaxed the atmosphere in the park is. 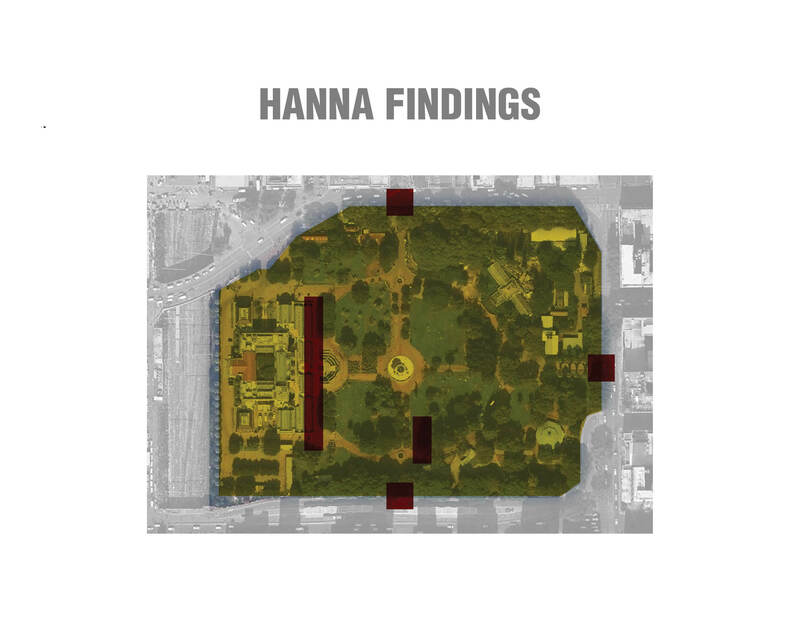 His Mental Map results showed that he felt more unsafe than Hanna who’s mental map showed a very different perception of space based on her background. Other park users agreed with the tandems experience and confirmed that they feel safe in the park and use is as green space in their lunch breaks or to play with the kids. The only areas neither the park users nor the tandem felt safe was the western edge of the park facing the Johannesburg Art Gallery. It is rather used by big groups of men, most likely drug dealers. But as in Görlitzer Park where drug dealing was obviously a part of the parks activity none of the park users felt threatened. There are large differences between the “official” perceptions and the informal perceptions of the park especially concerning the feeling of safety. Informality in Görlitzer Park (drug dealers, vagrants) is experienced negatively. 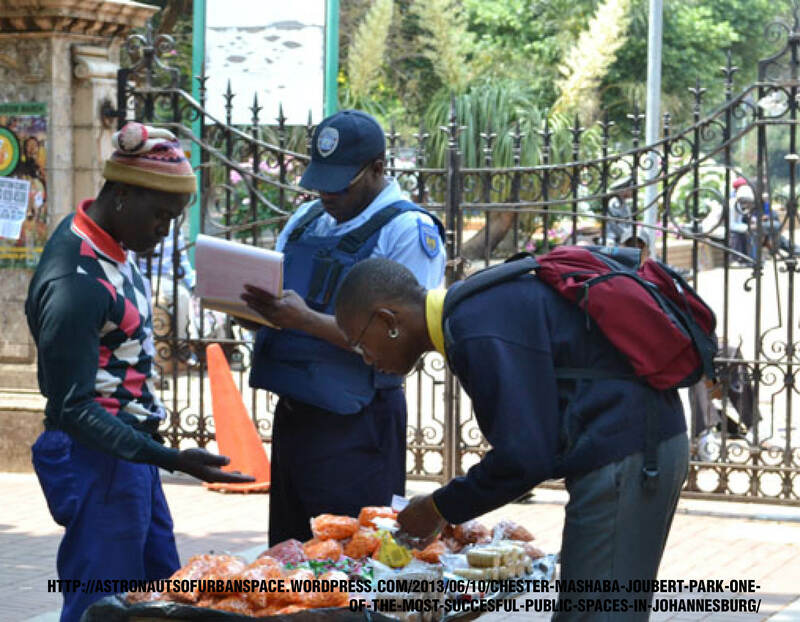 Informality in Joubert Park (informal safety network / photographers) is experienced positively.